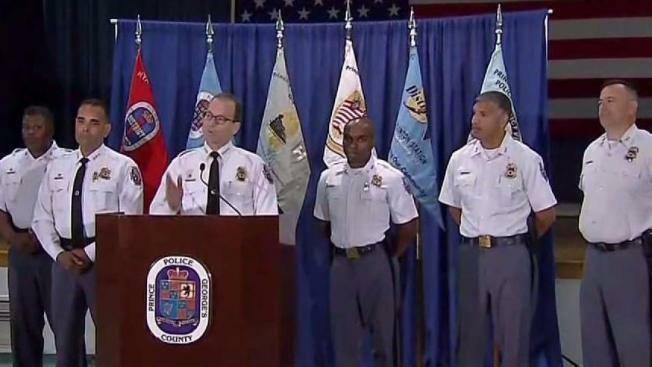 The Department of Justice is investigating allegations of discrimination against Hispanics and African-Americans within the Prince George's County Police Department, Chief Hank Stawinski said in a letter to the community Tuesday. Some officers say complaints about white officers are handled differently than complaints about officers of color, according to the American Civil Liberties Union. A 300-page complaint was sent to the U.S. Department of Justice last year. More than 100 county police officers have signed on to the complaint. Stawinski was notified Saturday of "a pattern and practice investigation into allegations of discrimination against Hispanics and African-Americans in violation of Title VII with respect to their employment in sworn positions on our police department." "I won't stand for it," Stawinski said in a news conference Tuesday afternoon. "I will not tolerate an unfair work environment I will not tolerate an injustice." Two officers told reporters at the news conference they filed the complaint alleging discrimination when it comes to transfers and promotions after first trying to resolve the problem with the chief. "The main reason for the complaint is that we get fair treatment for all officers regardless of race," said Capt. Joe Perez, representing the Hispanic National Law Enforcement Association. "If you look through the country, you see all kinds of race issues. What makes you think we're immune to that here? If you think it doesn't happen here, you're living somewhere else." Stawinski said he will fully cooperate with the investigation. "I and the department will cooperate fully and completely with this investigation and will provide any and all requested information to the Civil Rights Division without reservation," the chief wrote in his letter to the community. Stawinski said he learned in October 2016 of a complaint filed in March 2016. “One particular concern that they raised is that complaints that are filed by the public against officers of color are actually being treated more harshly than complaints that are filed against white officers,” ACLU of Maryland Public Policy Director Toni Holness said in February. The ACLU is working with the officers who filed the complaint. Some of the officers who signed the complaint are retired while others have been fired by the Prince George’s County Police Department. "As of today’s date, neither I nor the department has ever been provided with the complaint," Stawinski wrote. "I do not fault the Department of Justice for this." The department and the Fraternal Order of Police convened a panel in April to investigate perceptions of the department and make corrections, Stawinski wrote. The panel has met eight times. The department also began pubishing quarterly discipline reports in June, Stawinski wrote.